President Nana Addo Dankwa Akufo-Addo has stated that government can make meaningful change in the lives of Ghanaians, only if it directed its efforts towards developing the agriculture sector. “Majority of our people can only feel a change in their lives when we develop agriculture and if we are to make a headway, there has to be a fundamental change in attitude towards agriculture”, he said. President Akufo-Addo stated this during the celebration of the ‘Kobine Festival’ by the Chiefs and people of Lawra Traditional Area in the Lawra District of the Upper West Region. He noted that more than 50 per cent of Ghanaians were engage in agriculture, however growth in the sector over the last few years have declined dramatically. “Food has become unnecessarily expensive in a country that is blessed with fertile land”, he said citing non modern production methods and low income levels of farmers and fisher folks which according to him made the sector unattractive to the youth to depend on as a viable means of livelihood. 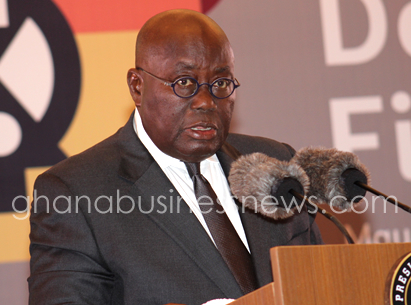 President Akufo-Addo stressed that the poorest people in Ghana were engage in food crop production, adding that the country have been making some successes especially in the cocoa sector to the detriment of staples like rice, maize and soya bean. The President stated that agriculture should not be a single crop industry, stressing that farming is a business and a profession that must be promoted and studied like all other professions. He said Ghana had the potential to feed her growing population, noting that was the rationale behind government’s flagship programme – the “Planting for Food and Jobs” (PFJs). Company had been resourced to buy the produce from farmers to ensure that farmers get the minimum guaranteed prices to increase incomes. The Agricultural Development Bank (ADB) and some selected Rural Banks have been engaged to make sure that farmers were paid promptly for their produce, he said. The President hinted that government would soon establish agro-processing factories through the “One-District-One-Factory” policy, saying the goal would be to provide ready market for farm produce, reduce post-harvest loses, add value to the produce and most importantly to create jobs. “These interventions are geared towards boosting farmers’ incomes, increase productivity, creating sustainable market opportunities and developing sustainable value chain agriculture”, he said. President Akufo-Addo who called for private sector partnership in the transformation of the agriculture sector, pointed out that agriculture remained the fuel that powered all activities in Ghana and assured that his government would certainly not ignore the sector. The President commended Naa Puowele Karbo III, Paramount Chief of the Lawra Traditional Area and his people for instituting and sustaining the festival over the years and using it to promote peace and unity among the people which he said was a pre-requisite for development. The 41st ‘Kobine Festival’ celebration which was on the theme “Improved Farming Practices for Food Security and Poverty Reduction” was characterized with colourful display of rich cultural heritage from both the people of Lawra and their neighbours in Burkina Faso.